At the Cook Islands Tertiary Training Institute (CITTI) we pride ourselves on our ability to identify opportunities, overcome challenges and work with and for our communities – work that is occurring within a rapidly changing environment – literally. Climate change; an aging workforce; new technologies; a tougher business environment with an increased emphasis on entrepreneurial activities; the need for higher level qualifications to meet the country’s employment needs; the need to create a seamless transition from secondary school to tertiary training; meeting the ever growing needs of our youth; the need to ensure qualifications are portable to the global market; the need for all islands within the country to have access to tertiary training; meeting National, Regional and Funder policies and priorities – all these factors affect the things we do. 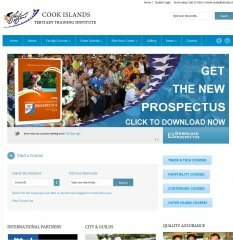 Our vision is to be a renowned provider of quality vocational services for Cook Islanders in the Cook Islands. Within this commitment, we have the confidence to embrace innovation. We have proven our success through the vast range of relationships we have established with industry, the community and individuals. CITTI invests in the skills of programme design, competency assessment, and adult learning, develops employer-led training customised to meet the needs of individual employers and learners, employs learning brokers to support employer based provision, expands the use and availability of e-learning, develops specific programmes to address the needs of young people, delivers training options to all islands of the Cook Islands, establishes industry advisory boards to advise the Institute on immediate training needs and assessment.